Edit: Well, Damn. I posted this yesterday, but blogger deleted it. Blogger also made comments disappear and other oddities. I'll be back on Monday with regular postings if Blogger permits! Have a nice weekend! You'll love Vancouver, Canada based thrifter's blog, SixBalloons where she shares her colorful vintage finds and displays a clear passion for the vintage hunt. Tell us a little bit about yourself, SixBalloons. I was born and raised in the beautiful city of Vancouver in British Columbia, Canada where I live with my hubby. We have a little house that we've put a lot of work into, and it's all been worth it - harvesting vegetables from my little urban garden has been one of my favourite accomplishments! My day job is quite technical and detail-oriented, and thrifting and blogging has given me a chance to have a creative outlet to contrast the analytical work. Starting up the SixBalloons blog has encouraged me to try different things with photography, and think about details like layout and presentation. It's a fun challenge because I know there are always things that can be refined and improved. For instance, my next task is to create a SixBalloons banner! My Dad has always been intruiged by garage sales and flea markets. While the rest of the family groaned in the car when we were kids, I'd jump at the chance to do some serious treasure hunting! The thrill of finding some mysterious trinket or great bargain always appealed to me. When we started furnishing our home, I was disappointed to find that many new items were of lower quality than those I grew up with (i.e. veneered particle board dressers, heavy porcelain baking pans). With some patience and heavy lifting, we were able to get several main furniture pieces in solid oak and rosewood. This has been a great foundation upon which to build. Then as we started to stock our kitchen and experiment with recipes, I knew that adding some vintage Pyrex and Le Creuset pieces would add quality and character to our space. What do you think makes thrifting in Canada different than thrifting in the United States or other places in the world? At least locally in my region, there are a couple of reasons I can see. First, there is a good culture of recycling and reuse. Then there is the convenience of donating used goods. It is very common for people to donate items they want to get rid of, sell them on Craigslist, or hold garage sales. Charities solicit donations and offer to pick up goods from your doorstep and convenient drop off bins are located throughout the city for clothing and book donations. This high volume of incoming product makes for great shopping for thrifters. I'm sure this is not exclusive to Canada, but our society values convenience, things that function perfectly, and of course, new stuff. Every time I find something amazing, I'm reminded of how wasteful our society can be. There really are hidden treasures to be found at thrift shops here. What are the names for "thrifting" in Canada? Estate sales are not very popular here, which I think contributes to lots of items being donated to thrift shops. Is there a large thrifting/junking/second-hand shopping culture in Canada? 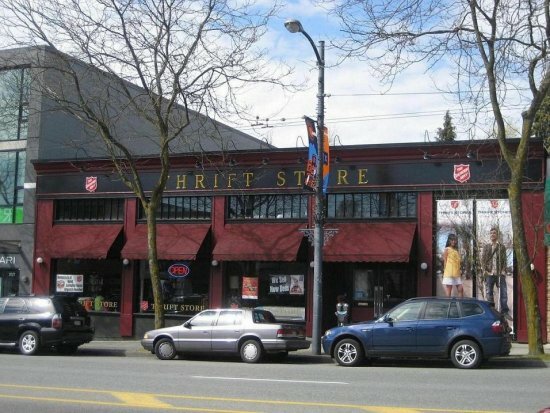 Vancouver is a big metropolis and it has become very popular to shop thrift. There are several high-end consignment retail stores for vintage fashions, household items, and mid-century modern furniture and finds. The typical chain thrift stores are generally quite busy, and you often see teenagers shopping for clothing, and families purchasing household items. Turnover is high, which is great for finding new items, but it can be slim pickings on a Saturday afternoon. Is there a stigma against second-hand shopping in Canada? Is it seen as dirty or something for low-income families? Yes and no. Because Vancouver is a fairly expensive city, there are wide income gaps between certain neighbourhoods. As a result, sadly, some thrift stores are shoddy and unkempt, and others can be quite expensive. I have noticed more of a depressing vibe in some stores, but most places are in regular neighbourhoods. The people in these average income areas are fortunate in that they likely choose to thrift. I would still say that you see the odd kid looking embarrassed about shopping at places like Value Village. You then have the young hipsters who are proud that they are rummaging around for deals and individual style. I think the general population here has gained an appreciation for vintage, and that has really changed the perception of thrifting. On the garage sale front, there is no such stigma, as it is almost a Spring and Summer past-time to wander neighbourhood sales. Are there any flea markets in Vancouver, Canada? What are they like? There is a big flea market in Vancouver on the weekends, and some smaller ones at community centres. There is a wide range of vendors - the vintage-collector-types, the new cheap trinket sellers, and the odd balls selling things like new batteries, shampoos and razors. I think the dollar-store type sellers probably provide convenience for shoppers, but it brings the excitement factor down for me. They also typically charge an admission fee, which further dilutes the experience. Are there many dumpster divers and curb-side shoppers in your area? In Vancouver, it is very uncommon to dumpster dive. There are a lot of concerns about cleanliness and safety due to drug-use and homelessness issues in some areas. In terms of the curb-side, you regularly see couches, furniture items, and small appliances set out with a FREE sign, usually around the end of the month when people are moving. These pieces usually don't last long, so that's a great system. I attribute this to the multiple colleges and universities as there are lots of young people moving to and fro throughout the year. Craigslist is very popular in Vancouver, and there is a long free section which helps move products along! Is there a large thrift and craft culture in Canada? New TV programs seem to be generating excitement about treasure hunting, and as housing becomes more expensive here, I think that people have less disposable income and more desire to find ways to save money. In terms of crafting, I'm not an expert on the subject of crafting but there are certainly talented local artisans that produce anything from pottery to specialty soaps to handmade knit items. What are thrift stores like in Canada? Generally clean, organized by sections, heavy on clothing and shoes, lots of donated small appliances, furniture and mugs mugs everywhere. Where is your favorite place in the world to thrift? I have to say my hometown and the outlying suburbs. I enjoy finding little local treasures that remind me of my childhood, like Expo '86 paraphernalia, or something relating to my favourite hockey team, the Vancouver Canucks! 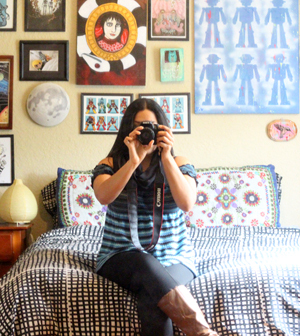 If you would like to be featured in Thrifters Around the World, shoot me an e-mail. I would love to interview you and chat about thrifting where you live. I follow Six Balloons so it was good to discover a little more about Mrs Six Balloons. p.s. I love those flags. Since I started my blog and began to follow other thrifters I have definitely noticed some differences in the secondhand shopping culture between the countries. This is a great series. I also already follow Six Balloons, but it was interesting to get an deeper insight into Vancouver citizens and how they feel about buying new vs buying used. Pam: Do it! I always try to make it to a thrift when I go to a new city...save room in your suitcase for a find or two! Kylie: I agree, nice to know a little more about SixBalloons, I love her colorful finds, photos, and passion for thrifting. Lakota: My favorite part of these interviews is getting an insight on thrift culture across the globe. So cool to see a blog interview with someone from my end of the world. I've been to a few of the shops pictured above and a few more are on my "gotta check that place out" list. looking forward to checking out SixBalloons! oh man i want that egg beater!!!!! so cool! SixBalloons is one of my favorite thrifty blogs!! She really has an eye for some true treasures! Nice post, Van! I just love Six Balloons and it was great getting to know her better. If I haven't mentioned it before, I really love this series! When I make the trek to Van, I'm calling on you Six Balloons! I'm surprised dumpster diving isn't big there. It's quite big here in Toronto. I've actually gotten some nice things from them myself. I find it really hard to donate items. I have to lug it across the city, boxes are not that common & when I do find them, they are marked CLOTHING ONLY. The Goodwill I frequent & will be walking distance from my house, doesn't take donations in store. BTW, that's that nicest Sally Anne's I've seen. Sir Thrift a Lot, the homeless population in Vancouver is pretty high and therefore dumpsters are either locked, or totally picked clean and sort of sketchy. We actually don't have any Goodwill's here. Only independent thrift stores, and VV and Sally Ann for chains. Lots of homelessness here too, I think we might have more than Vancouver, but the picking goes on. I'm quite surprised about there being no Goodwill's, but then again, I don't think there is any in my hometown either - Windsor. Sir Thrift a Lot, I'm always shocked at the awesome finds from Grunge Queen in Toronto... We just don't have those goodies. I think every thrift store in town takes donations so that reduces what gets dumped. SixBalloons: Thank you for all your feedback! I'm bummed that comments from Wednesday Thursday were deleted, too- but it's clear we all still love us some SixBallons :) . I just came across this post now when I was searching for something on Google - amazing how tight this community is as all the bloggers I know and love showed up on my search, many of whom have left comments here! Thanks for comments on Grunge Queen, Six Baloons (more a testament to Toronto goodies than me) and kudos on feature - sorry I missed comments that were wiped out.